I’ve been distracted this weekend, at my parents’ new place; between the regular chores and fussing about the computer situation, I haven’t been looking at things closely enough to blog about them. I also haven’t been out too much, preferring to stay within the comfortably warm house. 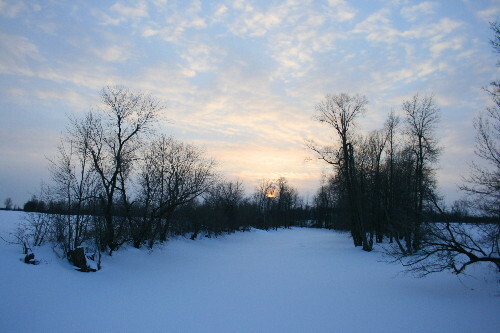 Though beautiful and sunny, today was a chilly -16 oC (3 oF) before windchill. The sort of weather that one likes to enjoy from the inside. I did venture out a couple of times to let Raven play, and of course I had to take care of the horses and stoke the wood furnace. I took my camera with me on the final run out today. The landscape is so different from the rocky lakes and forests where Dan and I live – here it’s flat and open. 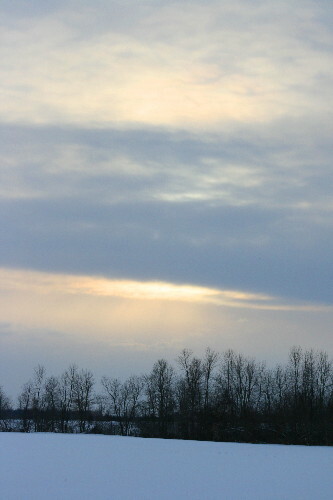 My mom calls it Big Sky Country, because compared to where they used to live, on the forested Niagara Escarpment, the sky stretches out to near infinity, finally meeting the earth at the far side of what seems, comparatively, like the endless expanses of the open prairie. The sunsets here are always interesting, since you can watch the sun sink so low to the horizon, unimpeded by trees or buildings. Today the lower sky was shielded by hazy clouds, subduing the colours of the setting sun, but beautiful in their own right. The snow here is considerably deeper than it is back home. In some areas it’s up to my knees, as high as Raven’s chin. 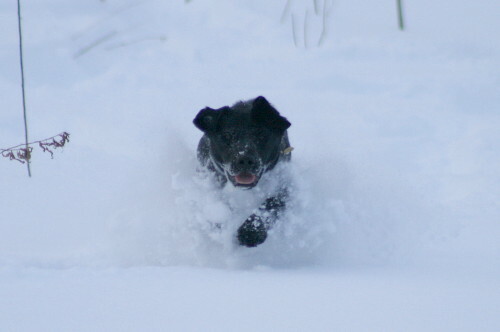 I really wished I had a video camera as I watched her bounding like a deer through the snow. Still photos just don’t do the boing-boing-iness justice. Raven had a blast. She loves snow. 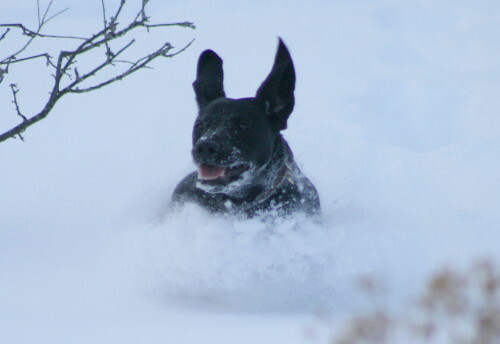 At home, when I take her for walks down the road, she can’t resist rolling in the snowbanks, or flopping around like a fish out of water when we go down to the thick snow blanket on the lake. 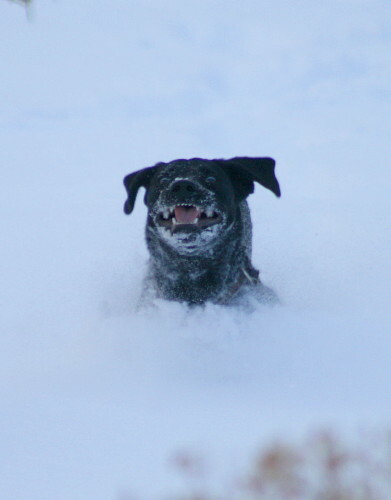 Here, she bounded about, kicking up snow with a big grin on her face. Her ears flying in the wind. And a goatee of snow from snuffling for voles. Great pictures of Raven having fun! Delightful pictures, esp. 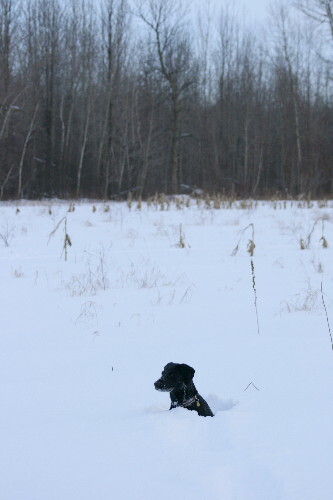 of Raven playing in the snow. 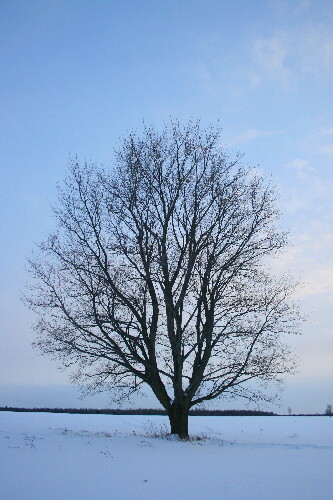 Beautiful tree. I love trees. I like how the snow makes a natural vignetting effect around Raven. The trees and sky are beautiful, and Raven is beyond cute. Great combination! The second Raven photo is too much. What a look! Made me laugh out loud! 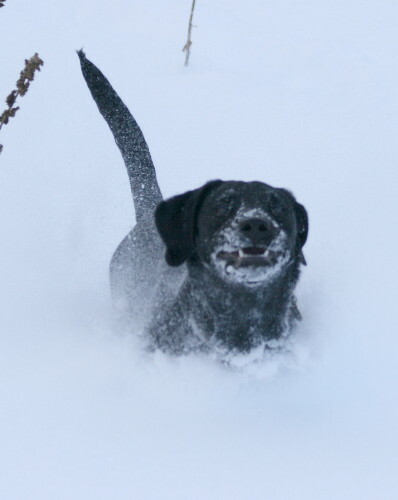 Such pure joy and abandonment when a dog playfully romps in the snow, eh? Beautiful. Thanks, my heart id just a bit lighter this morning for having stopped by here. Beverly, that video is too much!